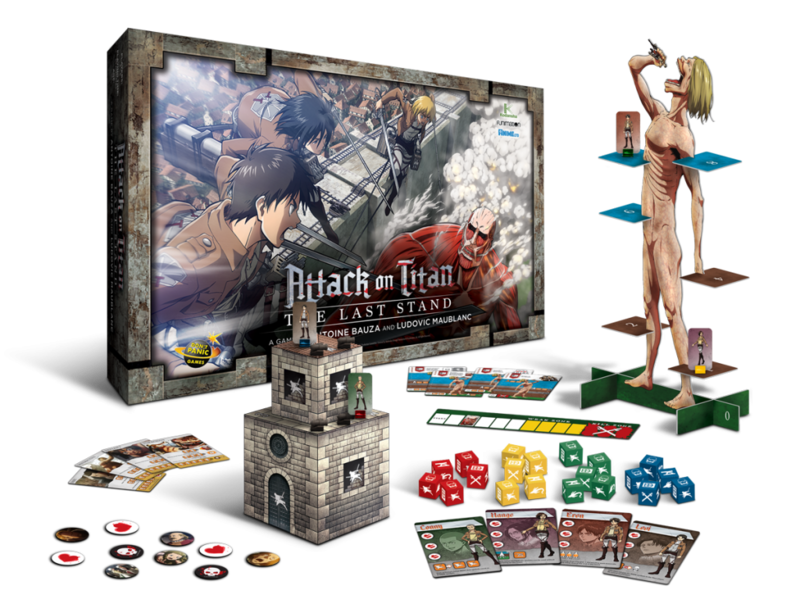 Cryptozoic and Don’t Panic Games have announced that Attack on Titan: The Last Stand, a board game based on the popular anime, will be released nationwide on July 26, 2017. 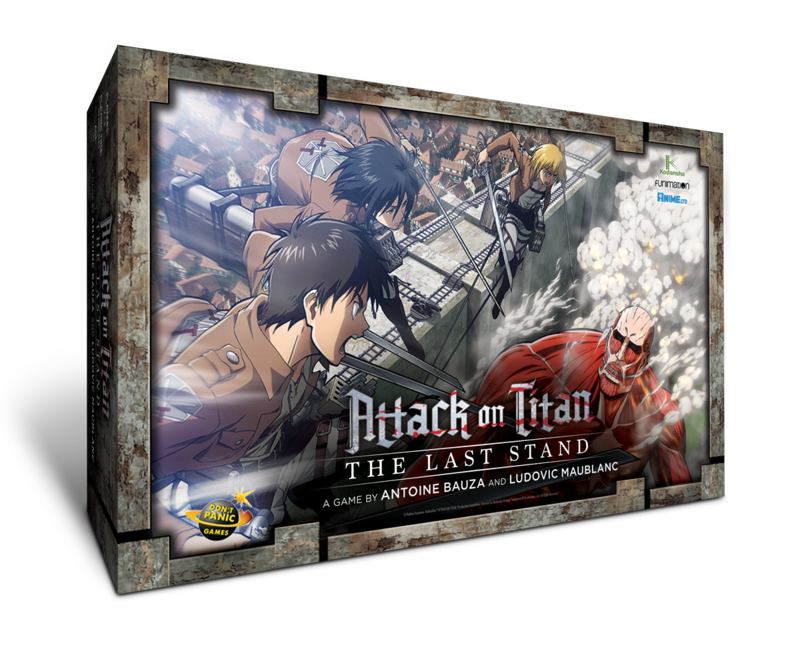 Attack on Titan: The Last Stand is an asymmetrical game. One player takes on the role of the Titan, while the other players assume the roles of the Survey Corps, who are trying to take down the Titan. The playing board is a large standee of the Titan itself and of a tower. Players will roll dice that let them utilize their maneuvering gear to fly around to different levels on the Titan and the tower. The dice will also allow players to attack the Titan with cannons or their swords. The Titan player will have action cards that they will play to perform devastating acts of destruction. They play two action cards at a time, one face-up and one face-down. The other players will have to choose to either allocate their dice symbols to thwart the first action, or hold them in reserve to deal with the second action card. They will also be using those dice to move and attack the Titan. So they’ll need to work together to decide which dice to use where. The players will be able to re-roll the dice as many times as they want. But if they roll a Titan symbol, they lose that die and it goes to the Titan player. The game ends if the Titan eats all 12 Citizens, destroys all six cannons or crushes all three hearts of one of the Heroes. The Heroes of the Survey Corps win if they can kill the Titan by slashing its neck. Attack on Titan: The Last Stand comes with 8 different Heroes from the show to choose from. All of the Heroes have their own standee and their own unique abilities. There are also four different Titan types to pick from, Basic, Destructive, Deviant and Voracious. The Titan player picks one type to play as for the game. This adds some nice variability and replay value to the game. I demoed this game a couple of years ago at Gen Con. The mechanics of flying around from tower to different levels of the Titan definitely captured the crazy awesome feel of the maneuvering gear from the show. I’m excited to check out the final version of this unique game. Hopefully it will be at Gen Con 50. Attack on Titan: The Last Stand is for 2-5 players and will cost $40. The game will be released on July 26, 2017.